New exhibition space in East Boston. It will hardly come as a surprise how many Boston artists have basically boycotted the ICA, or at least largely ignored its exhibition offerings, ever since the ICA moved to their new multimillion-dollar home on the waterfront in 2006. For those who keep track of history, the ICA then immediately eliminated Artists Membership (something the old Boston Visual Artists Union fought for and won from both the MFA and the ICA in the heady days of the 1970's). Next, to add injury to insult, the ICA decided to hold its Open House events on the First Friday of each month. Thus they deliberately put themselves in direct competition with the already existing First Fridays in the nearby South End (SoWa). The very successful SoWa Art District, which features many Boston artists' studios and now at least 30 art galleries, is still thriving, despite the ICA's effort to siphon the art patrons from it. Of course, the ICA can still make theirs First Thursdays, or last Fridays, or whatever... but we're still waiting for them to even recognize their artist problem... . This attitude is clearly demonstrated historically. Under the pressure from artists and Boston officials, the ICA used to hold yearly surveys of local art at their Downtown location -- which then became a biennial -- then if memory serves even a triennial? -- no matter... the local surveys were scrapped completely when the ICA got their new building. Along with artist memberships. This attitude is particularly unwarranted, as the very level of Boston art in general has risen consistently for the past 15-20 years. It also is an area of major opportunity, if the ICA chooses to embrace it. The ICA's consistent curatorial direction has been that of embracing conceptual and installation art paradigm. In that it has closely followed the NYC and much of international high art fashion of the previous 25 years. Boston of course has some fine conceptual artists, but on the whole is distinguished by the art that is more perceptual than conceptual. The fashion has shifted, even in NYC, in the past several years away from the conceptual, but the ICA is apparently still catching up. And in all truth, one has to acknowledge that a whole generation of art professionals -- and museum curatorial staff in particular -- has been trained in the conceptual art idiom, language and practice. Do they even know any longer how to talk about art that is mostly perceptual, how to elucidate it for their patrons and the wider public? One becomes accustomed to think in terms of 'projects' that illustrate 'concepts'. Evidently, it's always been easier to talk about those, than to talk about individual works of art. At the very same time, so many fine Boston artists still happily create art that is non-narrative, non-linear and non-illustrative, art that carries its own intrinsic value in continuity with pre-Conceptual Modernist art. Its visual impact usually does not need to be mediated by verbose labels and textural explanations to grasp it; it is meant to be understood more by the eye and by the heart, and less by the head. For example, a number of Boston artists, many of them women, carried the torch of textural and color abstraction, during the couple of decades of NYC galleries' neglect of such art. Several years ago NYC fashion changed, and now NYC features numerous gallery retrospectives of 'minor' abstract expressionists and color-field painters, many 'forgotten' women among them. Will the ICA rise to this challenge?.. they could... . Witness the ICA's exemplary and exciting dance and music program (many kudos to their entertainment programmers!) 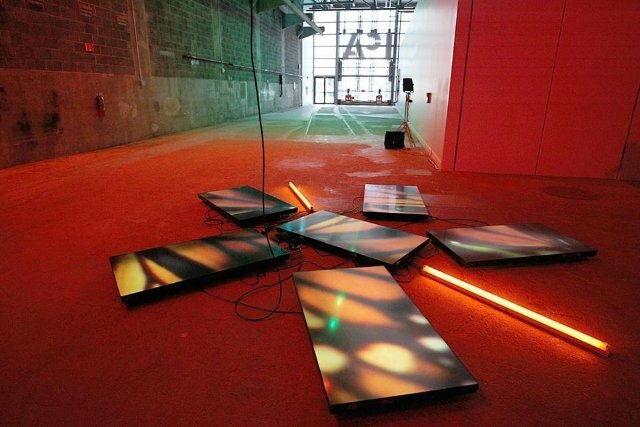 Will the ICA's art program evolve with the times and embrace the thriving local art scene?.. we all may hope so... but we're still waiting for them to even understand that they have an artist problem... .
Philip Gerstein has an upcoming solo show at the Galatea Fine Art gallery, Boston, October 3-28, 2018. "This article is instructive and illuminating. Thank you for helping me better understand the intersection between Boston artists and our art institutions." "It’s a sad state of affairs, but I’m afraid it’s a ubiquitous attitude among many museums. ‘Local artists’ fall below the ‘world class’ designation, and diminish the institution’s standing in the larger art world."